A native of Michigan, Jackson earned his B.A. from Williams in 1972 and a J.D. from Yale in 1975. He became the eighth dean of the Law School in 1988, and only the second to be recruited from another institution for the position. While in law school, Jackson was an editor of the Yale Law Journal, and after completing his degree, he clerked for federal district Judge Marvin E. Frankel and Supreme Court Justice William Rehnquist. A member of the New York and California bars, Jackson practiced law for two years with Heller, Ehrman, White, & McAuliffe in San Francisco. He became the eighth dean of the Law School in 1988, and only the second to be recruited from another institution for the position. Jackson came to Virginia after nine years at Stanford, followed by two years at Harvard. At Stanford he received the Hurlburt Teaching Award in 1984. Jackson’s major academic interests are bankruptcy, commercial law, and contracts. Jackson also served as the dean of the law school from 1988 to 1991 before becoming provost of the University. 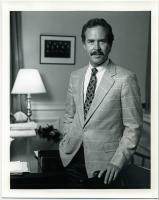 He departed in 1994 to become President of the University of Rochester.